On Friday I had a post about the golden record on Voyager spacecrafts, and it generated some questions about its scientific value (see comments here). And the answer to that is, well, the record is more about looking at humans and the Earth as a whole, rather than about achieving some "pure" scientific goals. 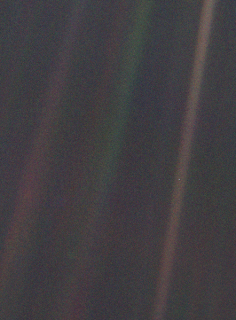 So on a related note, this week is also the 2oth anniversary of the famous Pale Blue Dot image of Earth (listen to the NPR story here about 6mins long). Again, is there a scientific value to that? Not that much. However, it is so much more than that and we should all be glad that NASA decided to finally snap this image. Also, check out this gallery of Views of Earth from the Middle Ages to the Space Age. The Pale Blue Dot...an icon of the enormousness of this Universe, a Universe immensely huge yet perfectly balanced by the similar immensely complex laws of nature...laws upon which our very existence depends. This image just reminds us that we have nowhere to go if we keep on plundering upon the extremely limited unreplenishable resources of this extremly small piece of rock floating all alone in the Universe. It is not based on silly fantasies like the thought behind the Golden Record that some day an alien civilization will fish it from the vastness of space and become impressed with it. In fact, I never found anything more silly than the this idiot idea. And yes, I agree with you that a it is not necessary for something to have a purley scientific implication to be important. If it invokes an urge to think, it is worth. But at least it should make some sense. Sure - we disagree here. I think an excuse to think about the representation of the Earth and its species is actually not really silly. In fact, this is fantastic out-of-the-box thinking (a nice ship-in-a-bottle metaphor here with the Voyager record). It reminds me of writings of many of the 17th/18th century thinkers about the possibility of life elsewhere in the solar system - and sometimes with a biting satire (for example, with Voltaire). Wonderful speculations! By the way, we have also had to think about similar issues of representing Earth and the its life forms when transmitting signals for extraterrestrials. Of course, the most famous one being the 1974 transmission in the direction of globular cluster, M13 (about a million stars in there), located about 25,000 light years away. May be we'll get a message back in 50,000 years. Or we may detect some other signal - left by some other civilization with a similar hope of contact as ours. Fun stuff! The point is to think big and use our imaginations (also why science fiction is such a good genre to explore ourselves). I miss Sagan. The idea behind Golden record was fabulous. It took human evolution years (some haven't evolved yet) to reach that kind of approach. Clearly this is an evolution in the wrong direction, based on baseless fantasies. The Golden Record is nothing much different from the concept behind Nazca Lines or Easter Island statues...to appease or impress hypothetical ETs. Can you please elaborate what direction would be right for evolution? Clearly you missed the sarcasm here. I believe sarcasm should be somehow based on logic (which is not the case here).